In Proceedings of the 2011 IEEE International Symposium on Mixed and Augmented Reality (ISMAR 2011), pages 165-168. October 2011. 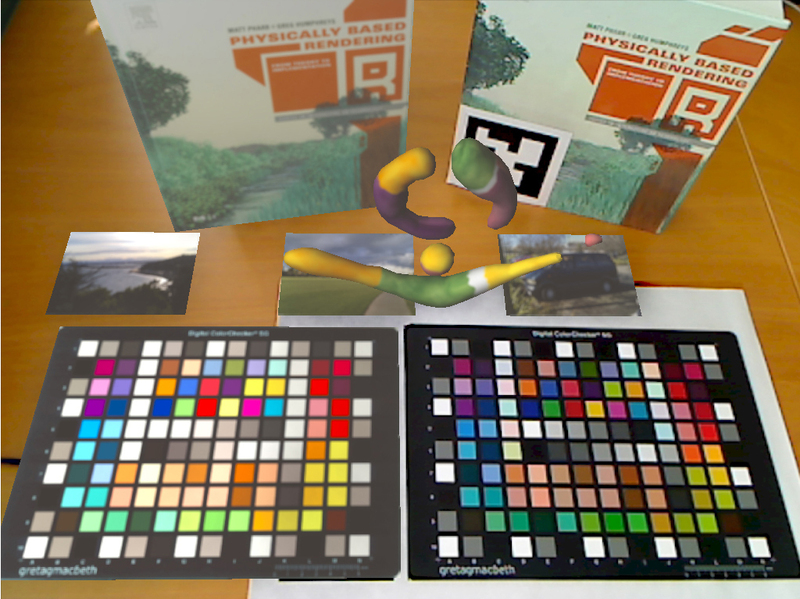 We present a novel adaptive color mapping method for virtual objects in mixed-reality environments. In several mixed-reality applications, added virtual objects should be visually indistinguishable from real objects. Recent mixed-reality methods use global-illumination algorithms to approach this goal. However, simulating the light distribution is not enough for visually plausible images. 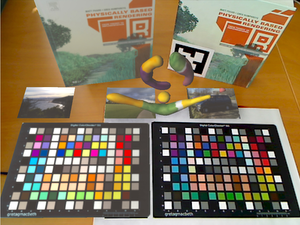 Since the observing camera has its very own transfer function from real-world radiance values to RGB colors, virtual objects look artificial just because their rendered colors do not match with those of the camera. Our approach combines an on-line camera characterization method with a heuristic to map colors of virtual objects to colors as they would be seen by the observing camera. Previous tone-mapping functions were not designed for use in mixed-reality systems and thus did not take the camera-specific behavior into account. In contrast, our method takes the camera into account and thus can also handle changes of its parameters during runtime. The results show that virtual objects look visually more plausible than by just applying tone-mapping operators. distribution is not enough for visually plausible images.